What’s the point of organizing your photos if you risk losing all your hard work because you didn’t back them up? I met with a client today whose friend recently lost all her photos and data. Her hard drive crashed and there were no backups. I hear these stories now and again, and it breaks my heart because this sort of data loss is totally preventable. About a year ago, DriveSavers technicians evaluated a failing drive. To preserve the data before the drive became inaccessible, they were able to create a full low level sector copy. The customer, however, declined the final cost. 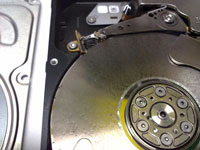 Since the customer had not committed to a written quote prior to the recovery, DriveSavers returned the physically damaged drive to the customer and destroyed the copy. Recently, this very same drive found its way back to DriveSavers. We don’t know exactly what adventures it experienced in the last year, but engineers in the Cleanroom found the DriveSavers warranty sticker had been removed and the drive was making clicking and grinding sounds. After an actuator swap, the end result was a no recovery due to a head crash. This was the same drive on which DriveSavers had successfully completed a full recovery only a year before and now was unrecoverable. This is a true story with a very important lesson: The first attempt is the best chance for a recovery—and sometimes the only chance! If you want to check out DriverSavers website, there is a link on our favorites page. 4. Don’t leave a drive “idle” for years on end. Copy all your files to one drive on even months and the other drive on odd months so you’ll always have the two latest backups. 5. If you’re unsure how to handle backups easily and efficiently, hire someone like Photo Nanny to come set up a maintenance plan that works for you. If you follow these tips, you won’t need a data recovery company at all. But if you have a drive go bad and find yourself without backups, DriveSavers are the guys for the job.